This is big local news here. It might be a good idea to purchase your ginseng from Lucky Mojo. If you must harvest your own, make sure you are on private property and have the permission of the property owner! What is the most common herb-oil-incense-bath you should buy? If you get a chance, please introduce yourself 9if you wish) on the introduction thread. Also, please be careful of where you post. I have moved and merged this post to the appropriate subforum. When you have a question, just go to the search box (the white box in the dark green area of the upper right hand side) and just search the words. In this case: Herbs. Take a look at the pages here (3 pages) There are ideas for storage. Anything airtight and out of heat and direct sunlight is good for storage. Hi, I have a question on pg 104 of Hoodoo Herb and Root Magic - For Male Vigor...it calls for Ginseng to be placed in Holy Oil, is it the root or powder? I do apologize if this is in the wrong forum. you would add the root, the powder would make a little bit of a mess mixing them together. I have read that Sesame seed is very lucky, jar half full of sesame seeds brings luck opens doors ala "open sesame", however I resenly found black sesame in the store, I ve check many hoodoo, wiccan, rootwork sites and books and no one mentions it. Is it the same as normaly sesame, bringer of luck, or is it bringer of negativy like black candles, black tip push pins, black salt, black ash? Has anyone worked with it? If so is it positive or negative? Yes, Lucky Mojo has all high quality products containing the real deal. No artificial replacements. I have read that sesame is good luck, road opener ala "open sesame", you should keep a jar half full of sesame seeds. However, I found black sesame seeds at the store. I have looked all over: websites, wicca blogs, rootwork forums, books, and no one seems to mention black sesame seed. My question is are they positive energy like there blond sisters, or negative energy like black push pins, black candles, black salt, black ask, black cats hair, something use to pull negativity? The only reference I have found was someone selling some in what look like tiny witch bottle, there were no instructions to say you keep in your house, or bury in your nasty neighbors yard. Please if anyone knows can you post back? In all honesty, I don't know if I would use them without Miss cat saying that it would be alright. What bothers me is that they appear to have different properties. There's identical genus, species. BUT the black ones have an added letter to their names. I also know that there's a higher content of certain elements and they emit a different aroma. Therefore, those differences make me uncomfortable. I'm sorry that I can't give you a more direct answer. Hi, I am getting ready to place an order for herbs however, have a question. In the book Hoodoo Herb and Root Magic, I want to try a controlling and a faithful spell, but it states to 'control a spouse' or 'make spouse faithful'. Are they just for married people or can I use on boyfriend? Pg. 184 A silver dime hand to get a job or to gamble - After the 19th day, what am I to do with the packet? Those spells are used to control and keep people faithful in a relationship not just marriage. After using it and it being successful ( gambling or getting the job) then you would ritually dispose of it. If its for good work such as this then bury in your yard. I treat my working herbs like cooking herbs " Give your herbs and spices an annual check-up: recommend that once a year you open each of your containers of cooking spices and herbs. Check for a fresh appearance (even in the softer colored herbs and spices there is an unmistakable freshness in the color when the item is new). Bring the container up to your nose; the aroma should rise up to greet you. If you have to “get to the container” to detect the aroma of a ground spice it’s a sign that the spice is past its prime. Note, however, that many whole spices (peppercorns, cinnamon sticks, etc.) have such a protective cell structure that they don’t reveal their full fragrance until broken or crushed." If you working with fresh herbs, when they go bad you kinda know. I also store different energy herbs in diffent areas, hexing and uncross don't live in same spice drawer, but money and love since most of them cross over are happy campers. Never take your gator claw over a river to the water, don't grind john the C in coffee grinder, unless you want tummy trouble. Luckbewithme876 wrote: Thanks. I'll take a look at them. Do you have to keep them in a certain kind of container? In a perfect world all my herbs would be fancy jars with proper labels ala Wicca Martha Steward, but when you got your cooking herbs, your magic herbs, and herbs that kill you under the same roof you use what you can. Mason jars are great if you can find them cheep, glass paste sauce jars and pickle jars if not too big. My oils always in glass, plastic gives strange odor and you cant heat it. Basil, rosemary, thyme, cyanne, ginger, black pepper, holy salt, all kinda stay in the plastic/glass jar from the store. Oak Moss and Poke I keep in paper bags, oak moss due to size and Poke cause it can kill you, bay, hyssop, five finger grass, angelica, rue, mint, fenugreek, Irish moss, due to the amounts I use keep in plastic zip lock or large jars, cinnamon keep in the container, clove is always in a jar. John the conquer I have few of them I keep them in purple bag in the sock draw, not sure why but they seem to like it. Magnetic sand and lodestones, I keep together till needed, normally plastic bag, because iron sand gets everywhere, you have to tend to your lodestones they have to cleaned of there sand gently, i like old tooth bush, they need to washed with Jack D or Holts, let dry, then returned to there sand, I shake it so it covers them again, try avoid recycling lodestones give them proper burial post use. There is site a LM devoted to lodestones http://www.luckymojo.com/lodestone.html I personally keep them in there plastic bag with iron sand, due the fact sand gets everywhere, unless cleaning, or using, and I never recycle they get proper burial or tossed into the river. Container wise I wish I could have glass containers with proper labels ala Wicca Martha Steward, but that's costly, and depending on use not good idea. I use mason jars, old pasta sauce jar, pickle jars, and beer bottles for witch bottles. Supermarket herbs: basil, thyme, rosemary, marjoram, cyanne, pepper, ect I normally keep in container came in. I use a lot of hyssop, rue, mint, bay, angelica, Irish moss, five finger, so kept in plastic bags. Poke, Oak Moss, Blackberry leaf, kept in paper bags, Poke cause its toxic, Oak moss due to size, need to keep dry, and in one piece, Blackberry because they got thorns. John the Conquer kept in purple bag in the sock draw, it like it there. Grains of Paradise i keep out of the kitchen so it not used a ordinary pepper, it hangs out with fenugreek, sassafras, cloves, and whole nutmeg in jars. All my oils in glass jars because plastic makes odd odor, and does not heat well. Graveyard dirt I get the day I use it, I do not store it in the house, because either the house protection will zap it or i just brought evil home, its normally in ziplock as it was easier to steal that way. Pine needle i get fresh, cause I am in the south. With regards to minerals, they stay good pretty much indefinitely as long as they are stored in a dry place. Yes Sant430 - you're correct. And thanks for the lamp idea - and if it were not for the small army of cats patrolling the house, I'd give that a try.... unfortunately, I'm trying to keep my name out of the newspapers...lol. i just received my order,i ask for roots chips but i receive 2 big roots of this plant,i wanna know how to use it.Cause i need to put it in my wallet but the roots is too big. I would suggest that you just take a cheese grater and grate the root into a bowl and save the excess for a later use. Not sure where to post/ask are there any hoodoo uses for Apricot or Apricot Blossom? I checked the "Hoo Doo Herb and Root Magic" book and didn't see anything also googled/binged only found association with love, I ask other types of practitioners but still nothing. The reason I ask is I've been having an interesting experience with a candle I won years ago at a Chinese auction and it's very aromatic fills my entire house almost 2000sq. feet with its scent and it's Apricot Blossom scent, every time I burn it even for short periods my father who has COPD among other issues ends up having a better day health wise... So I'm just wondering if there is anything Apricot Blossom is used for and is there more I can do with it? I'm not a chemist or experienced candlemaker, or an expert on COPD. But I wonder if there might be something in the formula of the apricot scent that has a positive medical/physical effect on your father's health? You'd have to ask a chemist and a doctor, I think. I don't know of any associations in hoodoo traditions for apricot blossom or any part of the apricot tree. If there are any spiritual reasons for the candle's good effects on your father, a divination might uncover them. Off the top of my head, though I'd be inclined to ask if there are any deceased members of your family who loved apricots or their scent, and were on good terms with your father while they lived. I am looking into more reasoning and to figure it out not just for my father but if there is something about it that may help other as well, I'll have to ask my father who may have liked apricot on his side. I know my maternal grandmother liked apricot, but she was not on good terms with my father. Are the herbs in the supermarket okay to use in magic? Or are they already "dead" from not being fresh long enough? Also what would be a good way to simply preserve how long herbs, oils, sachet powders, etc., last? I've already started stocking herbs in jars, but is there some other way to preserve them? I have heard of people using herbs from the supermarket for their work. I personally just order mine from Lucky Mojo because I trust their products to be the best quality. How long something is good for depends. Oils stored in a dark, cool and dry place can last for a long time. Powders are the same way. For individual herbs it depends on how well they were dried and what the herb is really. I do buy herbs from the grocery store and a number of sources. I don't feel that they're "dead" per se, but I do like the idea of purchasing from Lucky Mojo just for vibrational and quality reasons. Some things I just can't find anywhere else, like Deer's Tongue, and LM's prices are very very reasonable. If you compare the cost of star anise or poppy seeds in your baking aisle to that of LM's it just make sense. I do just feel too that there's something to buying products from a store like LM, which specializes in rootwork. I feel like it raises the energies. But...no, I don't think the herbs are dead. I think the spirits that exist in them are always in them, waiting to help and fulfill their potential. The ones in the grocery store just usually go unfulfilled and wind up in poppy seed muffins. Quick question about Hawthorne Berries...it says to sprinkle them around the home to keep another person from becoming your spouse's lover. We're not married nor do we live together, so should I sprinkle around HIS home or around the one who I want to keep from being his lover? Kinda figured, but you never know! Don't want to interpret the wrong way! If you get a chance 9and would like to) please introduce yourself on the introduction thread. 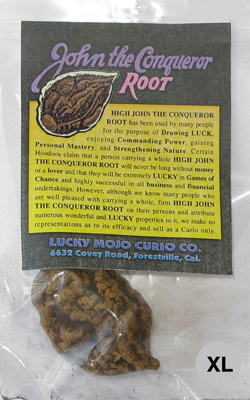 Yes, the Lucky Mojo herbs are charged/blessed by certified rootworkers. thanks so much, Miss Aida, for your help ! I bought Balm of Gilead Buds From LM but it is sticky like some kind of sap or something. Do i clean the balm of Gilead Buds or wash it or just leave it alone? Is it supposed to be sticky or dried? Balm of Gilead will always have a sticky sap to them when you purchase them from a quality supplier such as from the Lucky Mojo Curio Co.. I work with them as is for various works. Do i wash them or leave it be? No, don't wash them. Leave them be. And they are already blessed. Calamus root whole, High John The Conqueror root, Lucky Hand root, Queen Elizabeth root when used in a mojo bag and if it is time to refresh the bag. Do we replace the these roots or can we use back the same root? 1) If i need a cinnamon powder for emergency do i have to wake up the magick of the herb? 2) Or do I have to perform reading appropriate psalms over it to bless/charge the herbs? That is THE greatest book. I call it: "The Green Bible"
Yes, many people believe that you do have to do one or both of those things to the herbs, or talk to them. Some do not. There is no one way to work with herbs.